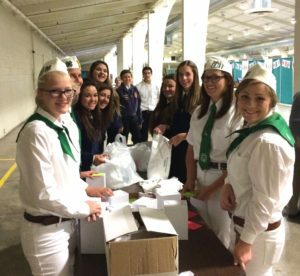 The Clover Foundation » 2018 Youth Ag Fundraiser November 3rd! 2018 Youth Ag Fundraiser November 3rd! Please join us for our MOST IMPORTANT event of the year!!! YOU can help the Clover Foundation support youth agricultural education and to provide access to livestock project management for any interested Santa Clara County Youth!! The Youth Ag Fundraiser is the place we generate the funds we need to do the work we do, and you can actively participate by simply joining us for an evening of great food and fun! We’re changing it up this year, so bring your friends and family with you for an evening of fun games and prizes!! Bid on Live & Silent Auction items, try the Wine pull or Beer Pull, buy a playing card for a chance to win cash prizes, buy a box for a chance at some beautiful jewelry or take a chance on the Cow Plop for a share of the pot!! A great Tri-Tip & Chicken dinner with all the trimmings, no-host bar with wine, beer & cocktails and a wonderful evening of fun for all! We are also looking for auction items and travel destination donations or maybe something else ?? (Be creative – if you have something you think is wonderful give us a call and let’s talk!). If you have an item of value or a vacation home or another great item to donate, PLEASE contact us at information@thecloverfoundation.org. To buy event tickets online, please select Get My Tickets! $65 per ticket, or a table of 10 for $600!! If you can’t attend, (and even if you can!) but would like to make a donation, please Select Donate! Santa Clara County Youth Fair – keep the 4-day fair tradition going! The New 2018 Youth Ag Fundraiser!!!! Join Us on November 3rd, 2018 – 5:30pm – 9:30pm! View the Youth Project display boards, Scope out Live Auction items. Try the Wine Pull or the Beer Pull! Buy a “Mystery Jewelry Box” or space in the “Cow Plop” for a chance to win! PLEASE JOIN US – YOU are truly the key to our success!! We look forward to seeing you November 3rd !! !